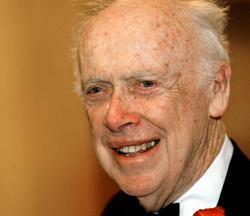 James D. Watson files amicus brief in case over Myriad Genetics' BRCA patent. But last month, he took a break from stirring the cultural pot to file an amicus brief (PDF) in the ongoing dispute over whether a company can patent a gene. In 2009, the ACLU and several other groups and individuals filed suit against the company Myriad Genetics Inc., which holds patents on the BRCA1 and BRCA2 genes. Myriad offers a test that looks for these two genes to determine a woman’s risk of breast and ovarian cancer. Because it holds the patent, no other company can offer the test—in effect making it impossible to get a second opinion. In 2010, a federal judge ruled against Myriad, but the next year the U.S. Court of Appeals for the Federal Circuit upheld the patents. Then, in March 2012, the Supreme Court set aside the finding and sent the case back. Enter Watson. His brief, filed last month, is technically “in support of neither party,” but he comes down decidedly against Myriad. His stature may carry weight, but on the blog Patent Docs, Kevin E. Noonan responds to the brief critically, saying that Watson fundamentally misunderstands some of the relevant legal points. Whether or not he sways court opinion, the brief is worth reading for its slightly gossipy tone. For instance, Watson complains about how in late ‘70s, he “had to defend recombinant DNA research from the attacks of the actor Robert Redford, who, along with the Environmental Defense Fund, raised money to stop experiments with recombinant DNA.” Coincidentally, just last month the Atlantic’s Megan Garber wrote about another bit of scientific panic in the ‘70s in which Watson took part—this time, over IVF, to which Watson was decidedly opposed. “All hell will break loose, politically and morally, all over the world,” he predicted in 1974.